I can easily count the number of times I have been to Paco Park: three times. And that already includes the time I went there two weeks ago with Eric, the blogger behind Byahilo.com. The first one was for a cousin’s wedding. It was held at night and I think I was just starting high school then. The second one was two years ago, when my sister and I were doing rounds of churches in Manila for a wedding we were supposed to plan. I never really got to explore the grounds, so when Eric asked for a good place to go on a Saturday, the first thing that rolled off my tongue was Paco Park. Neither one of us knows how to go there, though. The last time I went there with my sister, I vaguely remembered that we took a cab from SM Manila, and in less than 5 minutes we were there. The cab merely drove straight for a couple of blocks; the fare never even went past Php 40. When Eric and I took the same route, however, the taxi driver suddenly turned left at the first corner. He must know of an alternative route, I thought. Five minutes later, we were still on the road and though I’m not that familiar with Manila, I know we were driving away from where Paco Park is. When I reminded the driver for the second time that we wanted to go to Paco Park, he mutters, “Oh, I thought you wanted to go to…” Yeah, right. The Php 40 cab fare became Php 90, including a mini tour of Manila. Excitement quickly overshadowed all traces of annoyance towards our driver. Just the sight of Paco Park’s walls was enough to dispel any negative vibes. We paid the Php 5.00 entrance fee to the park and wandered in. 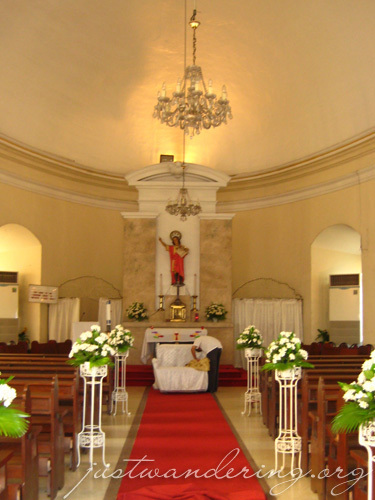 St. Pancratius Chapel inside Paco Park is one of the favorite choice for weddings in Manila. Last time I went to Paco Park, there were tables set up for a wedding reception in the grounds. This time, there weren’t any tables, but the old couple decked out in their finest piña tells us there’s going to be a ceremony in the chapel that afternoon. The chapel is usually padlocked. There’s no way to see its interiors unless there’s a wedding. We got there just as the organizers were setting up. Sneaking inside the now opened chapel doors, we see a small but elegant chapel. 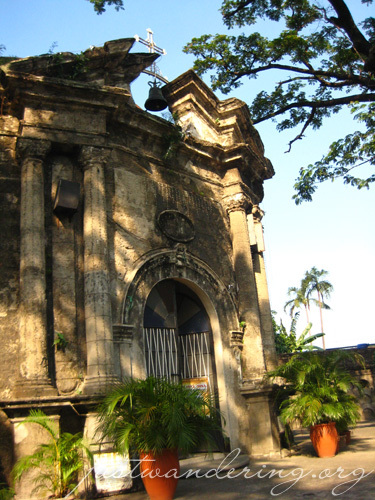 It may not be as fancy as the Manila Cathedral or the San Agustin Church; its simplicity is its main attraction. Not to mention the fantastic park. If you think about it, the park is pretty creepy. The inner walls are actually crypts, and some have been cracked open (though empty). 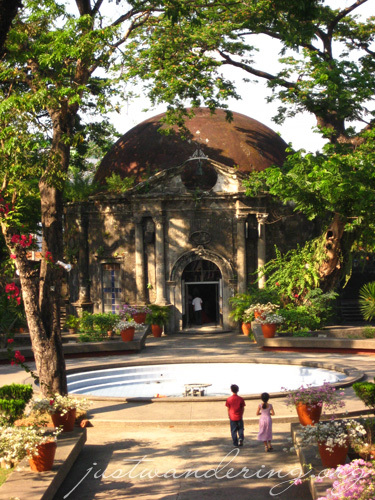 Paco Park was a former cemetery, and it used to be the resting place of four notable figures in Philippine history: the three martyred priests, Mariano Gomez, Jose Apolonio Burgos, and Jacinto Zamora; and our national hero, Dr. Jose Rizal. 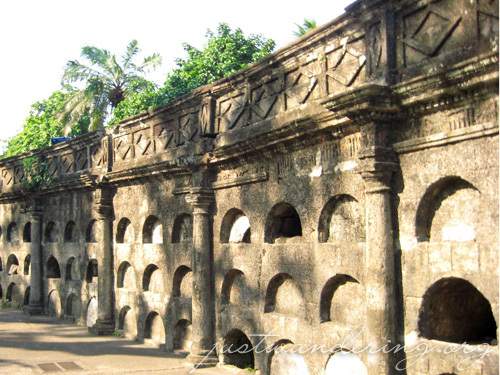 Similar to Fort Santiago, there are steps going up the thick stone walls. Walking around the perimeter gives you a different perspective on the park grounds. It also shows you the nooks and crannies where couples go to for some semblance of privacy. 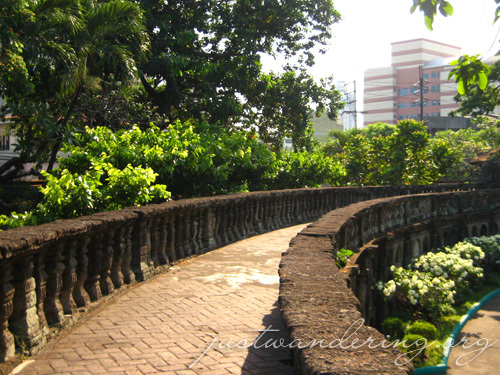 Paco Park ranks high in my list of places to visit in Manila. This recent visit re-affirms that. 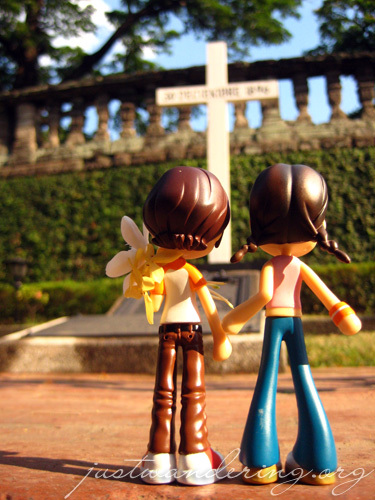 Though it’s a great place to chill with friends, you have to remember that there is a chapel and it was a former cemetery. ahahaha mag manila walking tour tayo ni melo next time! that sounds F U N! sama natin si ano… ahehehe u kjnow. Former cemetery? So what’d they do with all the… you know? Or were they stolen by Aswangs? Angeli: When you’re in Manila, you can’t NOT go to Luneta, Intramuros, CCP complex and Binondo! David: From what I’ve read online, all of the bodies have been exhumed and moved elsewhere (I don’t know where). The only one that’s still there is the remains of the Governor General inside the chapel. what do you think are the weaknesses of this park?